By Agus in Gadgets. Updated on February 28, 2016 . Technology has always lent a helping hand for people with disabilities such as visual impairment, speech impairment, people with motion disabilities or disorders etc. There are a lot of apps and gadgets that can help ease the difficulties people with disability face on a daily basis, and in this post you will be seeing 10 apps and/or gadgets that can do so. 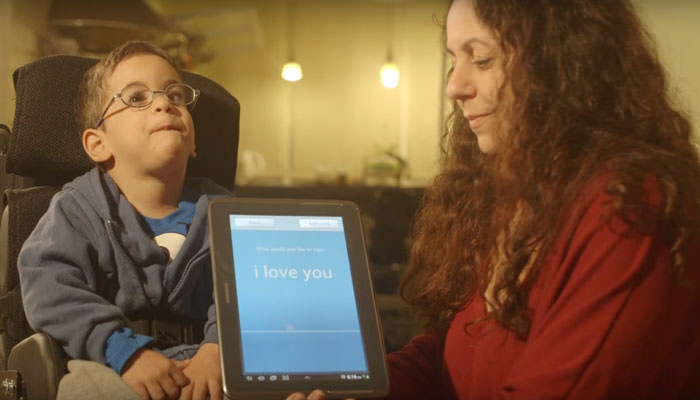 From providing help with reading despite a visual impairment, to keeping the deaf included in a group conversation, to helping patients with shaky hands have a meal independently, here are 10 assistive technologies that are helping the disabled get assistance when and where they need it. 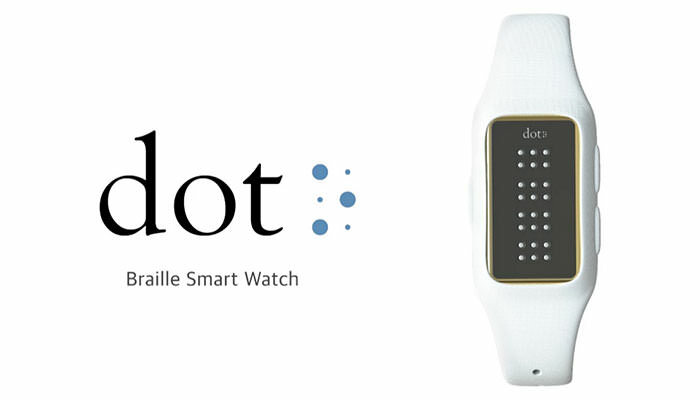 Dot is a wearable that is also the world’s first Braille smartwatch. Dot is a practical solution that is more affordable than regular e-Braille devices which may cost thousands, yet still works well for the blind. Dot helps the blind access messages, tweets, even books anywhere and at any time. Technically, this tool functions with six dots on four cells found on the surface of the smartwatch. These dots will rise or lower to form 4 letters in Braille at any time. It can connect via Bluetooth to any smartphone then retrieve and translate the text (from an email or messaging app) into Braille for its owner. Talkitt is an innovative application to help people with speech and language disorders to communicate with someone else. It will translate unintelligible pronunciation into understandable speech so we can understand what they meant to say, despite the speech impediment. Talkitt works in any language: it works by learning the user’s pattern speechs first, creating a personal speech dictionary; then Talkitt will identify and recognize the unintelligible pronunciation and translate them into speech we can understand. Mobile phone may have become a common need for everyone, including persons with disabilities. But regular phones are not equipped for the needs of people with limited mobility and who find it difficult to operate a normal phone. 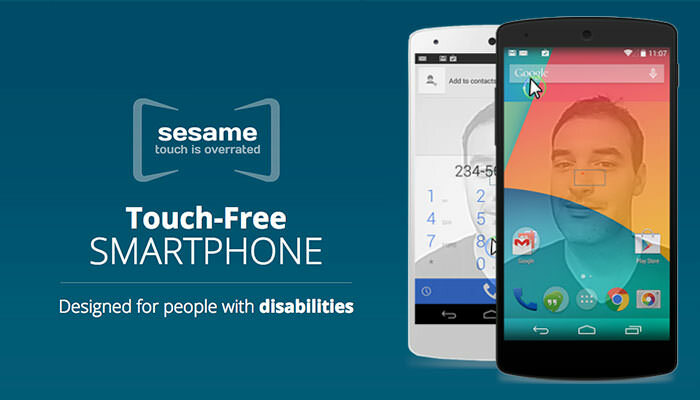 Introducing Sesame Phone, a touch-free smartphone designed for people with disabilities. This phone is designed to be used with small head movements, tracked by its front-facing camera. So you can access all the features of a smartphone, without even touching this device. Gestures are recognized as if you were using a finger to operate it: swipe, browse, play and more. Voice control is also added to provide a real hands-free experience on the phones. UNI is a two-way communication tool for the deaf using gesture and speech technology. This tool works by detecting hand and finger gestures with its specialized camera algorithm, then converting it to the text in very short time to provide meaning of a given sign language. Also equipped is a voice recognition software that will convert speech into text for two-way communication. UNI also enables you to create your own sign language with it’s sign builder, so it is easy to add custom language to the dictionaries. It is a subscription-based app with two versions, one that requires a data connection and another that doesn’t. Finger Reader is a wearable tool to help read text. It has two functions: to help the visually impaired read printed text on a book or on an electronic device, and also to be used as a language translation tool. 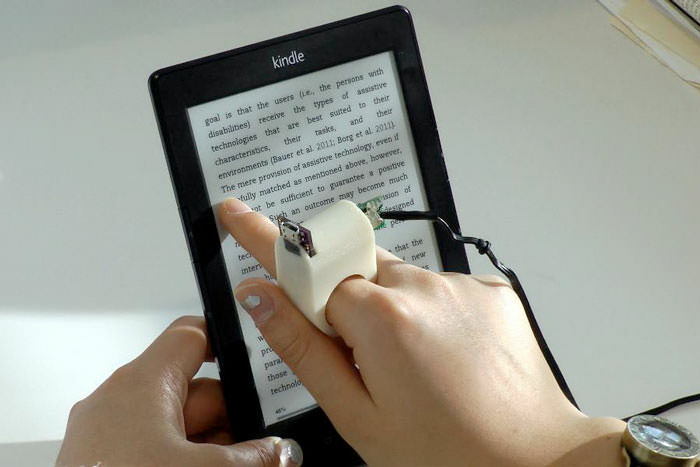 A user can wear this device on a finger, then point it on a body of text, one line at a time. The small camera on the Finger Reader will scan the text and give real-time audio feedback of the words it detects. It also notifies the reader via vibrations when it is at the start of a line, end of a line, moving to a new line or when the user is moving too far away from the text baseline. By My Eyes is a super-cool application that helps blind people “see” the world. It works by making a network that connects the blind with volunteers from around the world. It is an easy way to ask for help for simple tasks like checking on the expiry date on a milk carton. Volunteers will receive notifications or requests for help, and if they are too busy, the app can find someone else to step in and help. 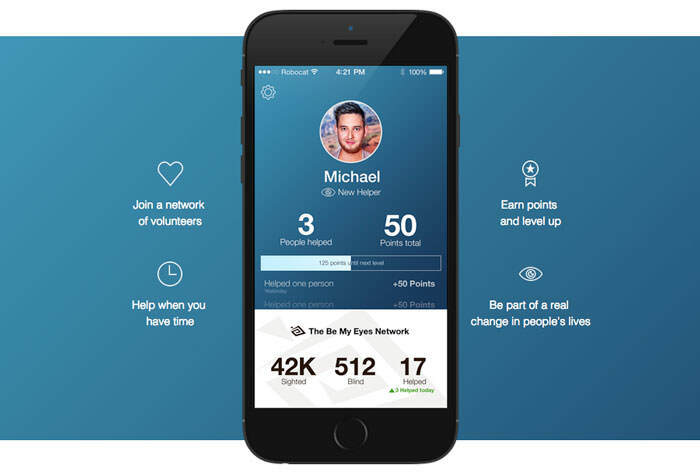 Each request will trigger a video call to volunteers so they can help the user. For people without disabilities, wheelchair ramps and wheelchair-accessibile restrooms are not things they notice. Many public sites are also not equipped with these facilities. This is a source of inconvenience to those who require a wheelchair to move around. AXS Map is a crowdsourced map that carries information about wheelchair-accessible ramps and restrooms in public places such as restaurants, hotels, shopping malls and more. 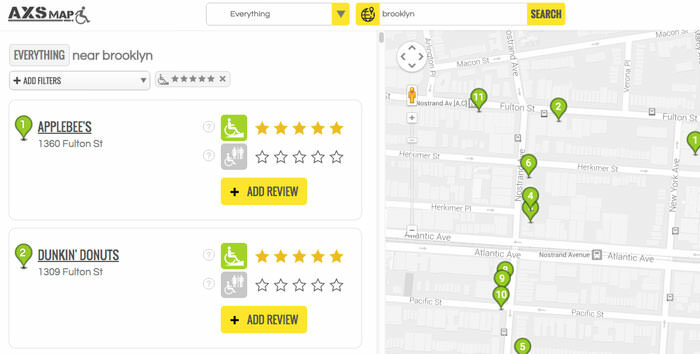 The map also carries information about how well-designed these facilities are with the help of star ratings. The deaf can communicate via one-on-one conversations using sign language or lip-reading, but about when a group conversation arises? 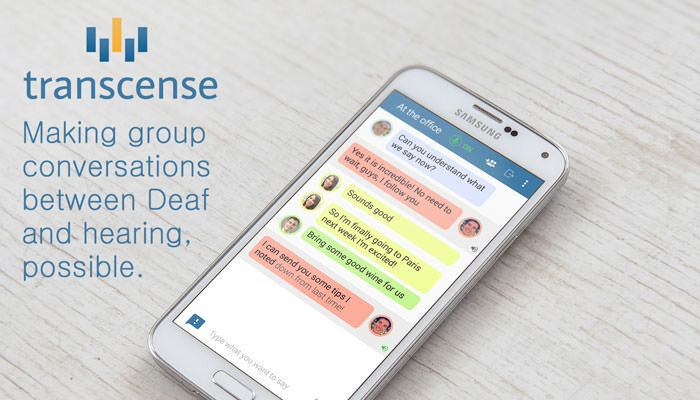 Transcence offers a great solution that can still keep the deaf in group conversations. In a conversation, with the use of each participant’s smartphone’s microphone, the app catches what they are saying then converts it into text in real time. Each speaker has its corresponding text bubble, differentiated by color, just like what you would find in a regular group messaging chat room. 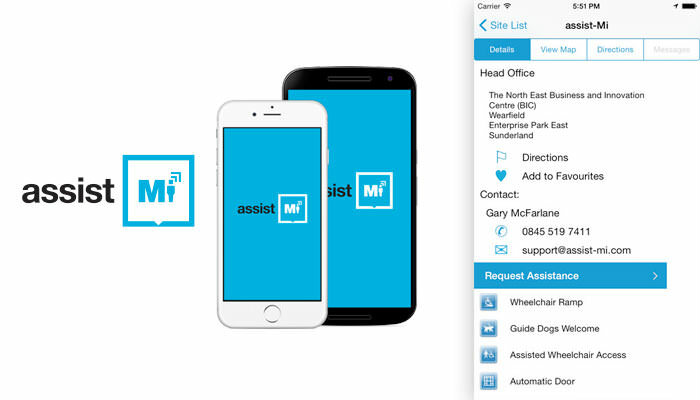 assist-Mi is an assistance application that helps disabled people to get assistance in real-time. It is basically an app that connects service providers and caregivers with the disabled who may need their assistance at a moment’s notice. Services include help in getting to work, to go shopping for essentials or for travel. It has a feature called Mi-Profile which provides a user’s needs so the service provider know what to do when assistance is requested. The app also has two-way communication and GPS for better location info. Liftware is a self-stabilizing handle on which you can attach an eating utensil like a fork or spoon. It is very helpful for patients who suffer from Parkinson’s disease or other forms of motion disorders that causes hand tremors. 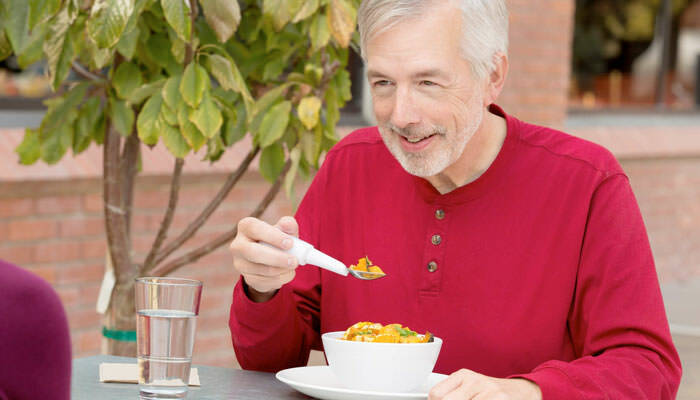 Liftware stabilizes up to 70% of the disruption and helps reduce the spilling of contents from the utensil before food reaches the patient’s mouth. Each liftware comes with the stabilizing handle, a charger and three utensils, a spoon, fork and soup spoon. Each charge can last for several meals and the handle can be wiped down while the spoons and fork can be washed like a normal utensil.